The form has been dictated by its function as a useful and executive piece of furniture. 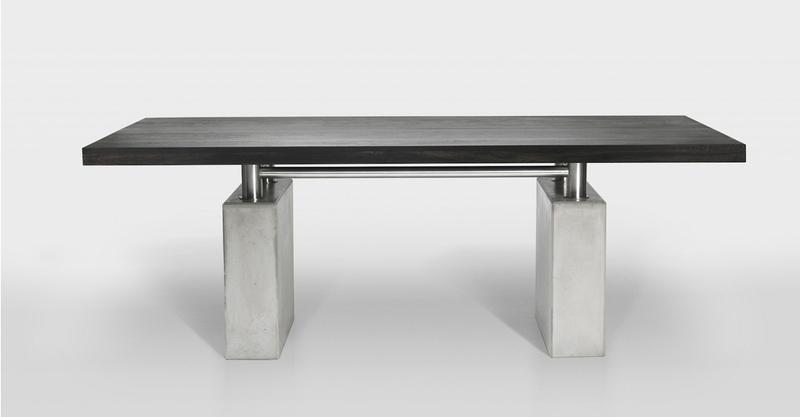 The materials used and the austere structure express the character of the people who use this table. The table’s simple and modest architecture brings to mind severe megalithic structures. It is honest and true, without any bizarre effects or unnecessary decorations. The value and expressive power of the object depends on the materials. When they are used consciously, following the architectonic logic of design, they determine its quality and stateliness. The concrete blocks that serve as table legs and provide its foundation are cast from special concrete that doesn’t emit dust. Solid frames made of high-grade stainless steel provide a stable structure. The table is covered with a massive top made of natural veneered and varnished wood.